Plastic ball bearings were created to meet the needs of applications where standard steel bearings failed. Traditional bearings are made from 52100 steel or 440C stainless steel. Both of these material types will rust if exposed to water. This makes them a poor choice for many applications including food processing, swimming pools and medical applications. Plastics can be easily machined or molded to better fit the application. The KMS engineering team has developed integrated bearing designs with the application by designing in mounting features that can be molded as part of the raceways. Further, the shaft can be designed as the inner raceway and/or the housing as the outer raceway. This new approach was developed to provide an innovative, cost effective way to solve age old problems. 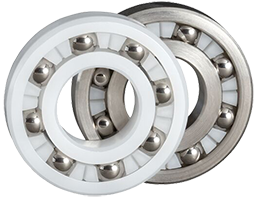 The solution is a polymer race radial ball bearing fitted with superior corrosion resistant balls (SS316, glass, ceramic or polymer). The result is a bearing that can make your products run smoother, quieter, and more efficiently with less maintenance than conventional steel bearings. Today Size, Shape, and Environment are no longer limitations. 1. Lightweight: Plastic is five times lighter than steel, thereby reducing the weight and energy to move them. 2. Corrosion Resistant: KMS plastic ball bearings can be utilized in environments destructive to conventional bearings. Plastic, by its nature, does not corrode. Our bearings can operate in hostile environments such as sea water, silicon wafer processing, plating solutions and swimming pools. 3. Customizable Design: Custom designs are readily and inexpensively made from plastics. This allows engineers complete freedom to design the bearing around the device rather than attempting to design the device around a limited range of standard bearings. 4. Lubrication Free: Steel bearings require lubrication to reduce friction, dissipate heat and prevent corrosion. Due to the design of plastic ball bearings, there is no metal to metal contact, which results in less friction. Many times the liquids the bearings are running in can dissipate heat and act as the lubricant. 5. Noise Control: Plastic has the inherent ability to dampen vibrations. Add lubrication and they become virtually silent. 6. Product Integration: A plastic bearing can be mounted into other components or parts such as plastic wheels, pulleys or housings. In certain design concepts, seamless integration can be achieved where the bearing will have the pulley profile as the outer ring, and the shaft or a fixing clip replaces the inner ring . This integration lowers assembly time and also results in utilization of fewer parts, increasing affordability. 7. Cleanliness/Hygienic: Plastic bearings generally operate cleaner than metal bearings because they do not need lubrication, they are resistant to corrosion, and they can be washed down without the worry of re-lubing. This capability makes them a viable option for clean room environments, and wash down applications. A plastic bearing made from either PBT, PVDF or PEEK can be post sterilized by standard methods such as autoclave or Gamma. 8. Shock Absorption: Plastic absorbs shock loads better than metal due to its elastic nature. Many conventional ball bearings fail due to Brinelling of the raceway, i.e. balls denting the raceways. Low coefficient of friction between plastic and stainless. 10. Non-Magnetic: Plastic ball bearings become completely nonmagnetic when fitted with polymer, glass, or nonmagnetic 316 stainless balls. They are ideal for use in MRI X-ray equipment or sensors where there cannot be magnetic distortion.